Among the disgruntled customers are ice fishers trying to get to Devils Lake, N.D. Kyle Blanchfield owns Woodland Resort, right on the lake's shores. The spot has "some of world's finest perch fishing," he says, and the sport this winter is better than it's been in 20 years. If only he had better luck getting his customers to the lake. "An awful lot of our groups have been stranded in Fargo, N.D., which is a 2 1/2-hour drive for us," he says. Those groups have been taking Amtrak as part of Blanchfield's "Perch Express" package deal. It includes all the ice fishing gear, a heated shelter, a fishing guide and a train ride from Chicago, Milwaukee or Minneapolis to Devils Lake. 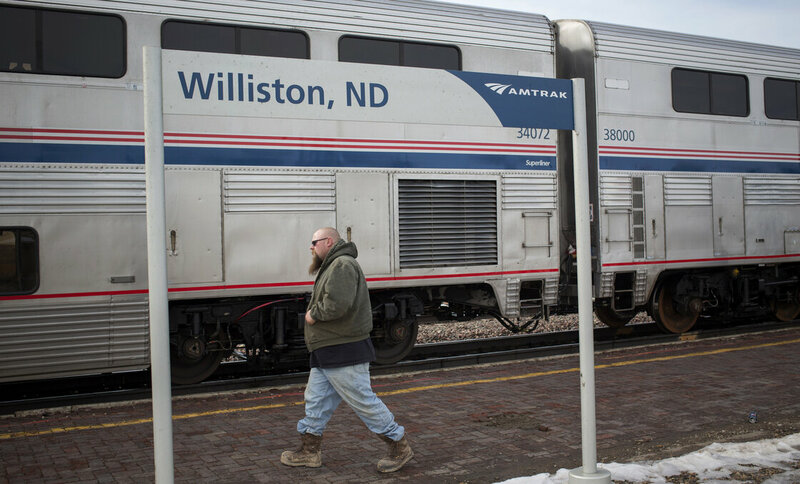 But this winter, Blanchfield says, Amtrak's service has become completely unreliable, either detouring the trains at Fargo or delaying them for up to 18 hours. "Valuable customers of ours — folks that we've spent a lot of effort to market to and to perfect a very good package and a good trip for — get here very grumpy," he says. "And you don't blame 'em; you can't blame 'em." So Blanchfield has been giving out a lot of refunds these days, and he's canceling all future Perch Express packages. The train delays, he says, are killing a big part of his business. Amtrak spokesman Marc Magliari says he feels the entrepreneur's pain. "It's a great concern to us," he says. Magliari says the Empire Builder is Amtrak's most popular overnight route, carrying more than a half-million passengers a year between Chicago and Portland and Seattle, but he says the delays are hurting ridership. "Arriving here in Chicago, delays of several hours, causing people to miss their connections to Eastern trains or Midwestern trains, have become very common," he says. In fact, on a recent day, the Empire Builder due at Chicago's Union Station a little before 4 p.m. is more than 13 hours behind schedule. But Magliari says it's not Amtrak's fault. "The primary reason the Empire Builder has been running behind schedule is problems on the host railroad," BNSF Railway, he says. And more often than not, the problem is a traffic jam of freight trains — locomotives pulling oil-filled tank cars, stretching as far as the eye can see. Ross Capon, president of the National Association of Railroad Passengers, says BNSF is giving the job of moving oil priority over transporting people. "The result of that is passengers are left out in the cold," he says. And Capon fears the chronic delays will give Amtrak a black eye. "If you are running a service that looks like a sad joke for an extended period of time, you're going to start to lose business," he says, "and then the people on Capitol Hill who don't believe these trains should exist anyway are going to smell blood and go in for the kill." Capon's group is calling on Transportation Secretary Anthony Foxx to intervene. But a DOT spokesman, in an emailed statement, suggested Foxx will not get involved in the dispute, saying "the Surface Transportation Board ultimately has the authority to enforce Amtrak's right to service preference on freight tracks to maintain high levels of Amtrak on-time performance." A BNSF spokeswoman acknowledges that the railroad is disappointed in its service to all its customers, but she says oil shipments alone are not responsible for delays. In an email, the spokeswoman says volumes of many other kinds of freight increased significantly last year, too. The railroad is investing hundreds of millions of dollars to expand capacity, but that track work slows trains. The spokeswoman also says extreme cold has exacerbated delays. In the meantime, Amtrak may just adjust its timetables and build the chronic delays into its schedule, so at least passengers will have a better idea of what they're in for.